My favorite snake showed up the other morning. I love the bright turquoise stripes on this Western Ribbonsnake, and the beautiful lines it forms as it moves. The last time I saw this species here was May of 2011! I don’t think this is that same individual; that one was longer. Back then, I had a hard time identifying it – I could tell it was a ribbonsnake, but there weren’t any blue-striped snakes in the two guide books I had. 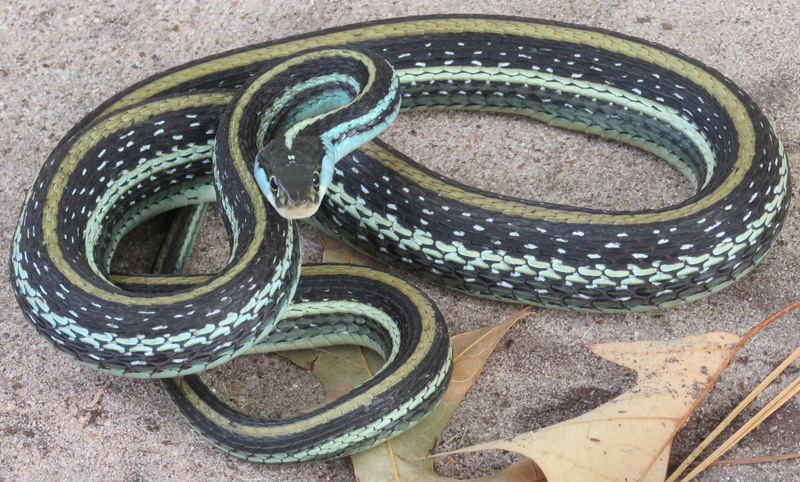 It turns out that there are four subspecies of Thamnophis proximus, and different colorations appear in different places, and the four subspecies interbreed. Herps of Arkansas gives its common name as Orange-striped Ribbonsnake, and they have lovely pictures of the different colorways, as we artist-types say. Some of the distinguishing marks (that I would never notice until they were point out to me) are two little white marks on the crown of the head, and a rear-facing white mark right in front of each eye. 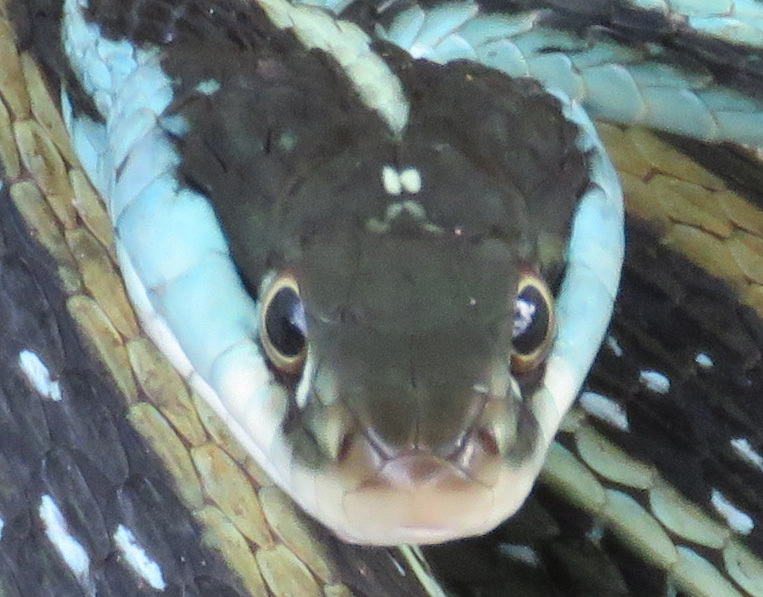 Tiny white dots on the crown of the head are distinguishing features of Thamnophis. I found a freshly-shed snake skin a few weeks ago, and I think it was from this snake, because there was a faint orange stripe right down the middle of the back. 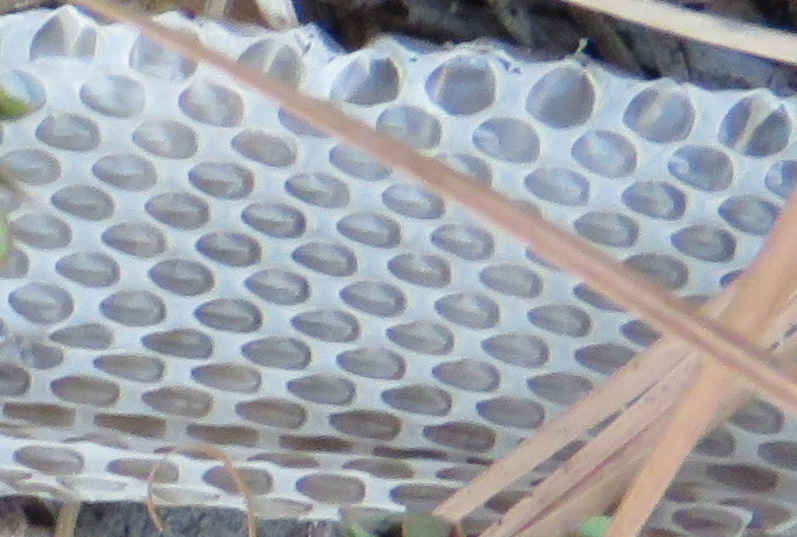 Snake skin with orange stripe visible. It is amazing to me how you can see the scales that were over the eyes. You can see the larger scales on the head and over the eyes. Even if you don’t like snakes, I hope you find this one is adorable. First of all, that blue color does not show up in animals often. And here, let me show it to you with long ears and eyelashes, and you will see how it looks just like a cartoon bunny. This snake is just some eyelashes away from being in a Disney movie. I’ve mentioned before that I really don’t like snakes, but I’m not as afraid of them as I once was. And this is a gorgeous snake! The turquoise is beautiful. That is one gorgeous snake! Such an awesome picture 🙂 Love it!! Thank you, it is nice to find that other people admire it too! WOW I have never seen such a beautiful snake!! Lucky YOU! I like the long eared version. I am sure the artist’s rendering was what affected you so favorably. 🙂 I figure if we can have jackalopes we can have herpajacks or some such creature. 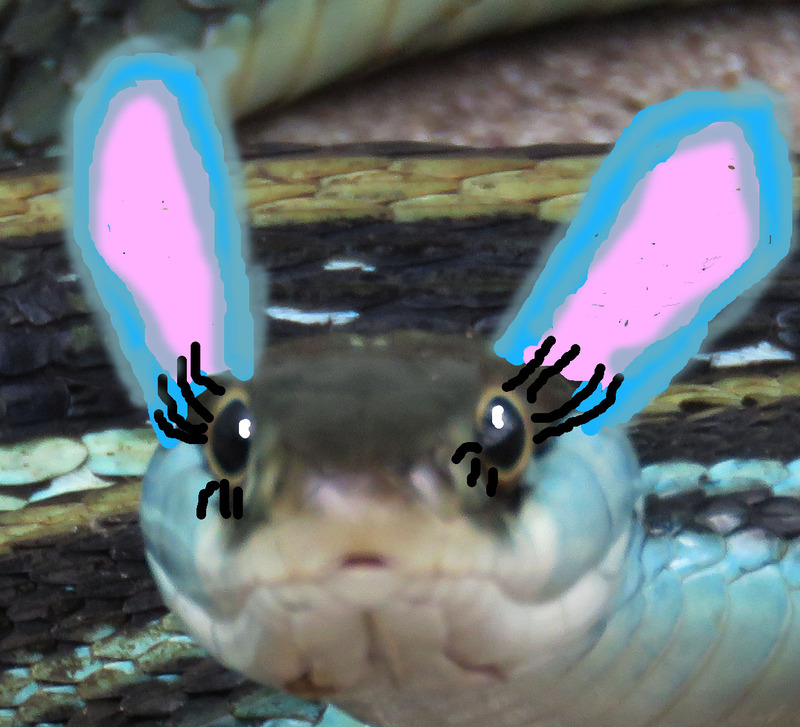 Yes the little wittle bunny wabbit snake was quite adorable! But he was pretty all on his own! Magnificent creature – but I would be very uncomfortable if I met one! I do love the added eyelashes and ears – and they make a good point. I looked at that Shepherd’s Life book you mentioned and it looks very interesting, but first I am reading a 1905 book with basically the same title, A Shepherd’s Life on the Wiltshire Downs. It is interesting, but I am 5 chapters in and the author has yet to get to anything about sheep! So far it’s a description of the area and poaching stories. But I am glad you pointed me in that direction! I happen to like snakes without the desire to fill a house with them or get too close to the dangerous ones. I’d be content to look at them behind glass or in their habitat provided they keep their distance and let me photograph/draw them. That ribbon snake is a beauty. And, yea, how often do you find blue creatures? Or, blue anything, for that matter. So many blues are fabricated. Nice image of the skin with the eye covers, too. And I feel the same way – I don’t mind coming across them and getting a picture, but I don’t want to have any as pets. I wouldn’t want a venomous pet. But, I see nothing wrong with one boa or milk snake in the house. Just not a house full of them. Yes, my daughter has a boa right now, for someone who couldn’t keep it anymore. It’s just part of her many-specied menagerie. Hoo, she would not want to hear that! She is more like my inspiration – I always liked wildlife but she has been crazy about it since she was born, and she really got me interested in it as well. What’s wrong with Bindy Irwin? Well, it’s nice a mother and daughter can share a common interest. I have not had an easy time with that and my own mother. No, I meant she is more like the Steve Irwin of the family. Although she prefers Jeff Corwin. Well, just keep her away from crocodiles and stingrays. I figured, since Bindy is Steve’s daughter and doing just about the same things (with less risk, I hope), she would fit that slot. I am not sure I am familiar with Jeff Corwin. Similar to Steve Irwin but a lot more respectful of the animals – his show is more about the animals and less about himself! Is Corwin the young-looking guy with the buck teeth, spiked dark hair and big eyes that talks really fast and kinda reminds me of Pee-Wee Herman? Nevermind, I just looked up Jeff Corwin. I cannot say I’ve ever seen that guy. And you know what, I’m dating myself, I still think of Bindy as a 6-year-old and her dad as the animal expert! Wow! That skin photo is great. I had no idea you could see the eyes in one. 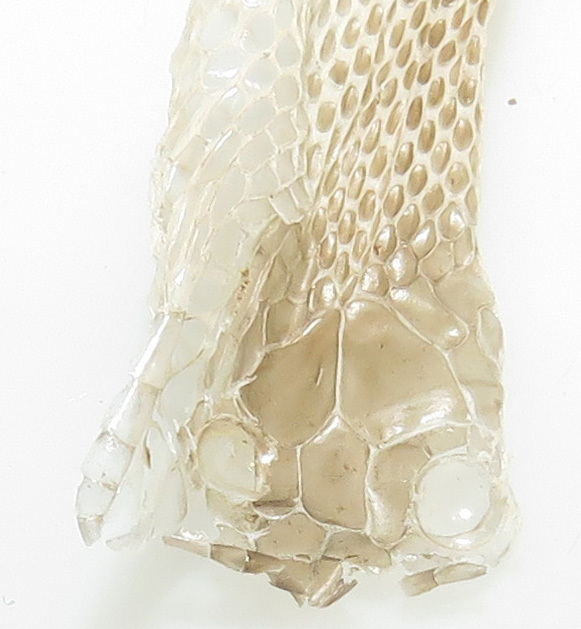 I usually only find parts of discarded snake skins and never saw the head piece. Yes, I must have come across this skin right after it was shed. It didn’t stay all in one piece like that long.